Tonight (Monday September 24) Australian Eastern Standard time from 6 pm for an hour as part of a UFO special programme on the US show Coast to Coast hosted by George Knapp Robert Powell, MUFON's research director and I will discuss the new book from Anomalist Books. Robert coordinated and edited the book. I wrote the 49 page Australian chapter. While I am biased I can highly recommend this impressive book. Amazon has a fairly detailed preview of the book and a number of pages from my own chapter can be accessed. "While it cannot be said of many books, UFO-themed or otherwise, this is among the essential ones. Stray from it at your peril." "This is easily one of the top five books about the highly controversial subject of UFOs"
"Don't be intimidated by UFOs and Government's formidable length. This is a justifiably indignant narrative about the contemporary equivalent of Galileo's 17th-century heresy conviction for daring to present the evidence for heliocentric reality. The history of America's hapless response to the great intellectual challenge of our time should offend everyone who subscribes to science as the arbiter for settling competing opinions. In an ideal world, UFOs and Government would provide the foundation for an honest debate on the real and ongoing drama unfolding in our atmosphere. But we will not get there unless and until scholars and historians confront the hard truths about our past. The road ahead starts here." 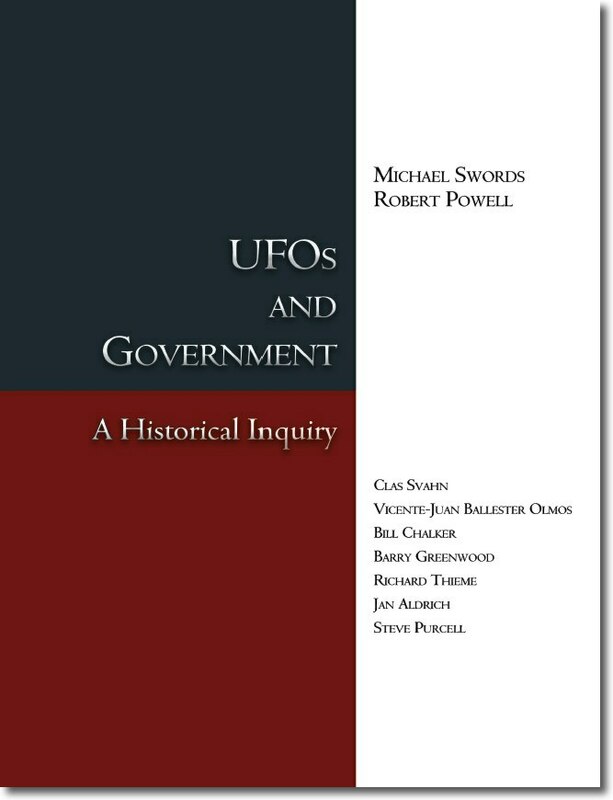 ".... a new, scholarly, work titled "UFOs and Government: A Historical Inquiry" written by members of the UFO History group, and published in 2012. The publisher is Anomalist Books of San Antonio, Tx, USA. ISBN is 19-33-66-55-80. "A little rundown of the group's members is in order. Jan Aldrich is formerly of the US Army; Bill Chalker is a renowned Australian researcher who was one of the first to get a look at Australian government files; and Barry Greenwood is co-author of the groundbreaking book "Clear Intent." 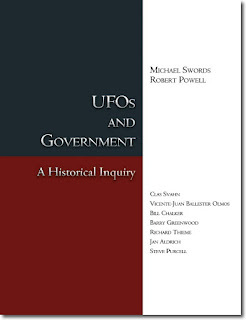 Vicente-Juan Ballester Olmos worked with the Spanish government's Air Force to review their files for public release; Robert Powell is MUFON's Research Director; Steve Purcell is a member of MUFON's STAR field investigation team; Clas Svahn is vice-chair of the Archives for UFO Research; Michael Swords is a board member of CUFOs, and Richard Thieme is an author and speaker. As you can see, the list of contributors to this work, speaks volumes about the serious nature of the quality of the contents. "As regards to the Australian experience "The Australian response was more of a middle ground," (p373) between the USAF's no official program from 1969, and the UK's, secrecy. Bill Chalker competently covers the RAAF's involvement, together with the early efforts of the Department of Civil Aviation. Harry Turner's extensive investigations and role, are well set out. A number of well known, and not so well known Australian cases, are documented, together with the official Australian response. "UFOs and Government" is a thoroughly, well researched and enjoyable read. It makes a magnificent contribution to our knowledge of global governmental response to the phenomenon. I heartily recommend it as an essential part of any serious researcher's library."